Aquarius is the eleventh sign of the zodiac. The sun enters Aquarius at slightly different times each year, usually around Jan 21, sometimes the day before or the day after. 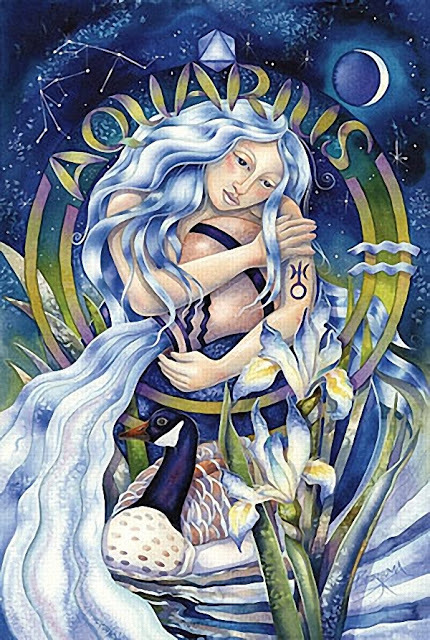 Aquarians are believed to be sympathetic, peace-loving, and strong-willed. They are independent, tolerant, broad-minded, intellectual humanitarians. Aquarians are progressive thiners, and are constantly looking ahead. They sometimes give the impression of being detached or aloof, as they can remove their emotions from everyday events. A Yoruban mother goddess and spirit of the river Niger. Oya flows with us through the last day of January, strengthening our passion for and appreciation of life. She is wild and irrepressible, like the fire she’s said to have created, yet Oya presides over matters of fairness and custom, using that fire as the light of truth. Artistic depictions of Oya show a nine-headed woman whose bosom speaks of fertile femininity. Enjoy a glass of water when you get up to begin generating Oya’s zest for life in your body and soul. This is also very suited to the energies of the day. 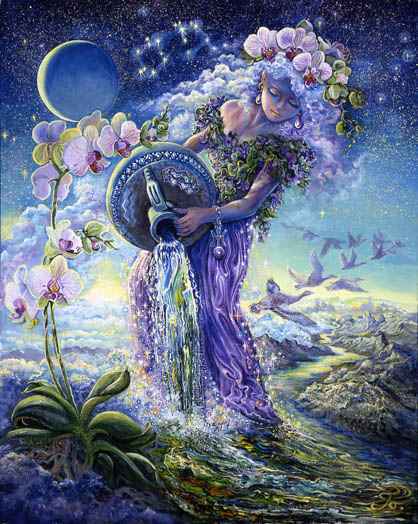 Aquarius represents the Water Bearer who continually pours inspiring, creative waters from celestial spheres into our lives. Get out and do something today. Invoke Oya through your pleasure and pure excitement. Dare to dream; then try to make that dream come true somehow. 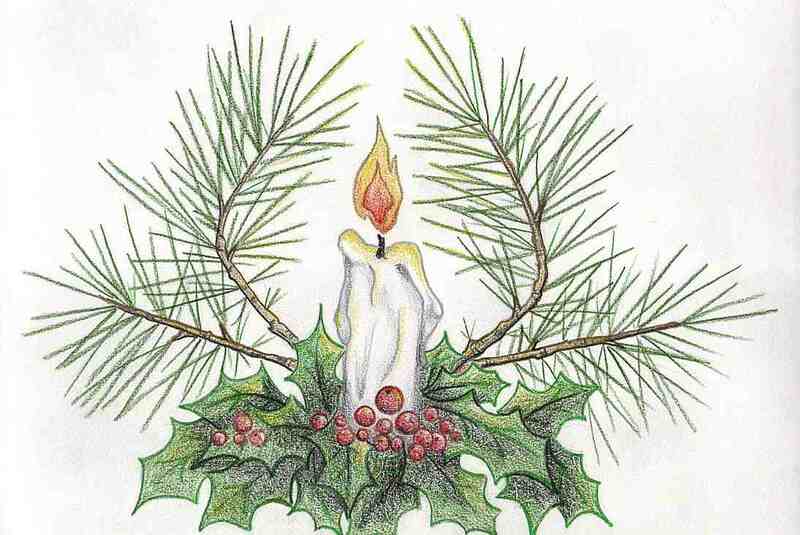 Drop a little water on the candle, then trim off the taper, carrying it with you to draw justice to you. 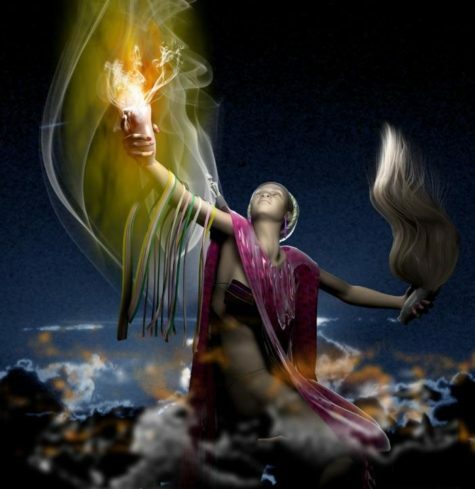 The Sun is in Aquarius from approximately January 20 to February 18, depending on the year. One of the standout characteristics of those born under the Sun Sign of Aquarius is their unwillingness to follow the beaten track. With advancement and progress on their minds, there can be an irreverence to old and outdated ways of thinking and doing things. Many Aquarians aim to free themselves of personal and social conditioning. Although open to change in theory, Aquarians can be surprisingly stubborn. Their idealism runs strong, but they can be very fixed in their opinions. Often a bit aloof and even standoffish, Aquarians nonetheless are usually well-liked. They are curious and observant, and tolerant in a broad sense. Prejudice and bias is offensive to the typical Aquarius. Aquarians are generally very clever, witty, and intellectual. They value progress and frankness. It’s difficult to throw Aquarians for a loop—they’re generally on top of things. There is a bit of reformer in Aquarius. They’ll try to get you to see through superficiality, and encourage you to be open and forthright. “Be true to yourself” and “Don’t follow the crowd” are mottos we easily associate with this sign. November’s Full Moon beckons us to look deep within. With the Sun in Scorpio, the Snow Moon is a potent time to look beyond the obvious. This is an excellent time for dreamwork and lends its energies easily to meditation and divinatory efforts as well as projects that require endings. 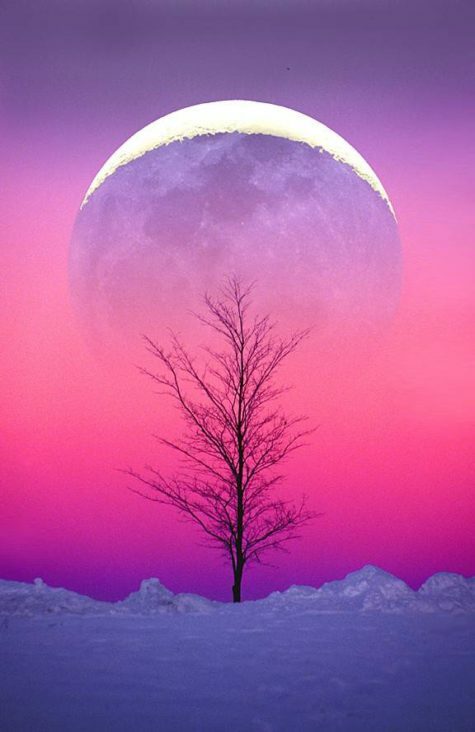 Use the Snow Moon’s energy for setting magickal goals into motion, as well as planning for the reinvention of your life.Take advantage of this transitional period to set your goals for the future in motion. The Quadrantids is an above average meteor shower, with up to 40 meteors per hour at its peak. It is thought to be produced by dust grains left behind by an extinct comet known as 2003 EH1, which was discovered in 2003. The shower runs annually from January 1-5. Best viewing will be from a dark location after midnight. 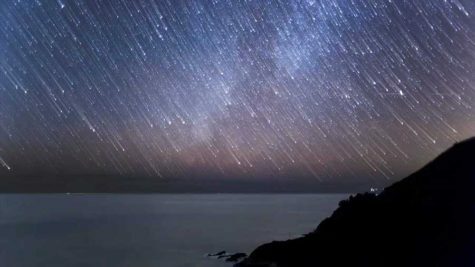 Meteors will radiate from the constellation Bootes, but can appear anywhere in the sky.